Providing for excellent navigation support, these Solar Navigation Lights for Small Boats are corrosion resistant and provide for long-lasting usage. Available at competitive market prices, these lights provide for illumination of 50 Lux and come with optical lens arrangement that supports 360 degree Illumination by high intensity Red LEDS that provide for over 10 years of service life. Further, these lights offer operating support from temperature of -10oC to + 60oC, are in conformance to IP – 55 standards and are available in casting made of S.S painted with UV paint for atmospheric protection. As a no replacement, no maintenance light, these are also optimized for solar based, stand-alone applications. •Stand-alone operation: optimized for solar based, stand-alone applications. 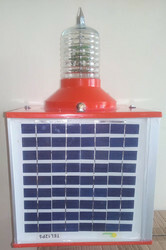 Looking for Solar Navigation Lights for Small Boats ?